Hello, welcome to Books in the Wild, the podcast about exploring books. I’m Keri Schroeder. It’s been awhile since our last episode; I have been busy with other projects and unfortunately I’ve been neglecting this podcast a bit, so thank you for hanging in there. I have a few updates before we talk about today’s topic, which is all about fake newspapers and prop printing. Editions is a book arts co-working space and gallery in Seattle, but it’s also a worldwide community of book artists. The editions.studio website has a blog of all things Book Arts, and the forums are a great place to connect with other book artists, ask for advice, share techniques, and find collaborators. The Editions store has lots of paraphernalia, and you can sign up for classes both in Seattle and online to learn more about book arts, and about the business of book arts. You can learn more at editions.studio. Another cool thing that may interest you bookmakers and printers is The Paper Carnival’s limited edition book art enamel pins, which you can find at thepapercarnival.com and use coupon code BOOKSINTHEWILD for 15% off your order. The Paper Carnival is a side project from myself and Julie Chen of Flying Fish Press where we make book art related collectibles that aren’t actual books. Right now we have six different book art tool pins, like a nipping press, Vandercook, and pica pole with more to come. Then on Saturday April 21, 2018 in San Jose, Coyote Bones Press and The Paper Carnival will be at the S.F. Bay Area Printers’ Fair & Wayzgoose. Print enthusiasts, students, educators, graphic designers, typophiles, artists, and printers new or old will enjoy the demonstrations, tours, and array of vendors and exhibitors. All ages are welcome! So come by and say hi and buy some pins and prints! The S.F. Bay Area Printer’s Fair and Wayzgoose will be at San Jose’s History Park April 21st. For more information visit printersguild.wordpress.com or SJ printers guild on Facebook. And now let’s talk about some fake news! If you’ve watched any television shows or films in the past hundred years or so, you may have seen characters reading newspapers that seem somewhat familiar but somewhat off with titles like the Los Angeles Tribune or The New York World. One particular newspaper that appears in dozens of shows features a woman with dark hair and the caption, "She’s 3rd Brightest But Hard ‘Gal' to See", or a full-color front page image of space titled “Comet Show Leaves Nation Speechless” or ads for Brenner’s Black Cat Brew or M essence perfume. In the sitcom Married With Children, Ed O’Neil’s character Al Bundy sat down on his mustard yellow floral couch nearly every episode and read the exact same newspaper from 1986 to 1997. This same newspaper makes appearances in Scrubs, Modern Family, No Country for Old Men, Everyone Hates Chris, Back to the Future, Desperate Housewives, Charmed, That 70’s Show, The Texas Chainsaw Massacre, and classics like Citizen Cane and Cincinnati Kid… and many many more. There have been several online compilations made with images of various movie characters reading this same newspaper. So why does this mysterious newspaper keep showing up in all these programs for decades? Well, in 1957 there was a paper shortage caused by rare pulp-eating critters called wigglemorts, from the French meaning “cellulose death worms”. After a particularly bad infestation at the Foghorn Paper Mill in Cincinnati, the government declared a state of paper emergency and banned the production of nonessential paper products. And for the next fifty odd years, Hollywood had only one newspaper in its possession to use as a film prop which was passed from set to set accompanied by an armed guard. No, I’m just kidding. That was fake news! I don’t know French. See how easy it is? So why does this newspaper really keep showing up on film? Well, it is fictional newspaper created as a film prop, that much is true. And if you’ve never noticed these identical newspapers before, it’s because film props are meant to blend into the background. Just like some would say about typography, it usually only gets noticed if it’s bad or feels out of place. Even people who claim to know nothing about design would think it’s weird to see an obituary written in comic sans, and also would probably notice if an ancient Roman soldier were wearing a digital wristwatch on film. This particular prop newspaper is simply a stock item prop available for $15 each originating from the Hollywood prop printshop known as Earl Hays Press. Over the years, the newspaper has become a bit of an easter egg for film buffs, and like the Wilhelm scream stock sound effect, filmmakers continue to include it in their films as a wink and a nod to film history. The stock newspaper is just one of the over 25,000 different printed products that the Earl Hays Press produces. They specializes in custom props and period accurate printing. Let’s say you need a historically accurate newspaper from June 14, 1947. Earl Hays Press can do that for you. They make sure every detail is accurate, and copyright free, so you don’t have to worry about it. An avid traveler in the early twentieth century, Earl Hays would sketch the license plates and collect newspapers and ephemera from all over the world. He collected famous issues like the London Times announcing George Washington's death, or the sinking of the Titanic. When he founded the press in 1915, Hays used this collection as reference material to print accurate props for filmmakers. Soon, Earl Hays Press became known for their masterful recreations of printed matter and believable fictional product brands. Today, Earl Hays Press is still family-owned and operated although Early Hays himself has long passed. However, current owner Robert Hernandez Sr. has been dedicated to ensuring the same accuracy and attention to details at the press since the 1960’s. Now semi-retired, Mr. Hernandez’s family and small staff share the workload. Earl Hays Press are experts at recreating not only newspapers and magazines, but also have made fake brand food and drink packaging, signage for fictional businesses, license plates, passports and state IDs, police and government official badges, and even money. Anything and everything where it might not behoove the filmmakers to have the “real thing” in their movie. They have a large selection of period specific graphics and typefaces, along with practically a museum’s worth of historical references. Film production companies use fictional brand props because it’s usually cheaper, and much much simpler than all the legal headache of gaining clearance and licensing, or dealing with product placement fees. So instead, they can pay Earl Hays Press to create products like Morley Cigarettes the preferred brand of the Cigarette Smoking Man from The X-Files. Or they create brands that sound familiar enough to be accepted, but not so familiar that you could get in trouble for it - brands like Teb Soda, Cola-Cola, Captain Sugar or Fudgie Flakes cereal. Altering a trademark logo into something unreadable but still reminiscent of the original is a process called Greeking. The complication lies in that prop masters need their items to be believable, to sell the illusion set in the film, but not so recognizable that it conflicts with the “likelihood of confusion” trademark regulations. The goal is for the audience to glance at the item, recognize it as soda or cereal or whatever it is meant to be, and then move on and not linger. Too many or too few details, or inaccurate details results in breaking audience immersion. Earl Hays Press owner, Robert Hernandez recalls seeing a performance of Annie, which is set in the 1930’s. During a scene where a man runs onstage presenting a telegram, Hernandez saw that the paper was a modern-day telegram design, with a big bar from the State Department on top. He was so disturbed by the discrepancy that he called the prop man the next day and sold him a dozen telegram blanks from the correct time period. It seems innocuous, but someone will notice. It reminds me when some friends and I saw an advertisement for bookbinding that showed a paperback book being squished inside a nipping press, and we laughed and laughed. What sets Earl Hays apart from their competition isn’t necessarily the printed products themselves, but their authentic feel, largely due to their impressive collection of reference material. They have an archive of all kinds of printed materials throughout history, with font and paper samples to match. Though some of the processes are digital these days, many clients want the props to feel as authentic as possible, and so Hays often still prints from their old presses with period type, woodcuts, and plates. As owner Hernandez mentions in an interview, most of the time is spent on research and planning; the actual printing is the easy part. To recreate a newspaper, one would need to be familiar with the history of newspapers. Though there were bills posted with news on them dating back to ancient Roman times, the newspaper as we know it, an inexpensive widely distributed periodical of contemporary happenings and announcements started in the early 1600’s in Germany, about 100 years after the development of movable type which made printing more accessible. From there, the printing of newspapers developed and spread, with most major cities having their own newspaper (and even sometimes multiple competing newspapers) by the 19th century. Then as now, publishers raced to have the most up-to-date news faster than the competition, resulting in the daily newspaper by the mid-19th century, which because typesetting was still all done by hand meant that compositors would work overnights setting type to be ready to print before morning. The development of Linotype machines in the late 19th century, lead to even faster printing and laid off a lot of type compositors. The linotype machines were attached to a keyboard that composed text, casting type, and redistributing the type molds. The linotype operator used the keyboard to assemble molds, or matrices of letters of sequential letters, then molten lead was put into the mold creating a line of type, linotype, to be printed. Sometimes the metal type was still hot as it was pressed into the paper, spawning the term “hot off the press”. To make a newspaper, first a blank form is created with sections divided to be filled with news stories, ads, and headlines. This blank form is called a dummy. Then all the articles need to be have the appropriate size and style of font and spacing (called leading and kerning in typography) to fit into the allotted spaces. This process is called typesetting, because it literally used to require setting individual pieces of type into a form to be printed. Now most typesetting is done electronically, at least in the newspaper world. Once the typesetting is complete, the digital page is then transferred to film via laser. I should mention that what I am describing is how they make newspapers now, as we didn’t really have this laser photo imaging technology in the early days of newspapers. So after the laser does its work, the film is processed into negatives, which are then used to make printing plates. Then these printing plates are used to print newspapers. This is usually done with an offset press, where the plates transfer the image onto large cylinders, which the paper is run through and the image is off-set onto the paper. Today, some commercial offset presses can be ginormous, two stories high and can print up to 60,000 copies per hour. Most prop masters don’t usually need newspapers in such quantities, so smaller presses are typically used. But the typesetting, layout and printing process is more or less the same. The difference being that many newspapers in films are entirely fictional, and rather than editors focusing on accuracy of facts, they focus on the believability of the contents. But prop masters don’t necessarily choose to use fictional newspapers because it’s difficult to get real newspapers’ approval. Many well-known papers such as The New York Times or Los Angeles Times, will gladly allow for their papers to shown on film, provided that they are recreated exactly as the originals. Exactly, down to the typeface and layout, every advertisement and headline and ornament. When Earl Hays Press was tasked with printing replica newspapers for the montage scene in The Godfather, they had to find the original papers from the 1950’s, recreate the design to a t, and print new old copies, which then need to be cleared by the publisher. This site lets you browse and search a fully digitized archive of newspapers from all across the country. It is a very cool site to get lost in, if you’re into reading old news and advertisements, or are looking for reference material to recreate a particular era of print design. Earl Hays doesn’t only make props for films. They have made fake ID’s and badges for undercover police, FBI, and Homeland Security for sting operations and drug busts. In exchange, Earl Hays’ work with law enforcement has allowed them access to items like badges, warrants, and other official documents that aren’t easily accessible to the general public. One of the more complicated items for prop companies to make is money, because you have to walk that fine line of believability and authenticity, and this is illegal currency and you’re going to jail. All negatives, plates, digitized storage medium, graphic files, magnetic medium, optical storage devices, and any other thing used in the making of the illustration that contain an image of the illustration or any part thereof shall be destroyed and or deleted or erased after their final use in accordance with this section. Title 18, United States Code, Section 504 permits black and white reproductions of currency and other obligations, provided such reproductions meet the size requirement. So how does the film industry work around these restrictions? Very very carefully. One trick that filmmakers use is to glue a real bill onto a stack of blank paper, because contrary to popular belief you can use real money in movies, it’s just that in scenes where you have millions in cash on the screen, one usually doesn’t want to carry and transport millions in cash to a set where dozens of people are coming and going. Small changes will be made to text, like “For Motion Picture Use Only” instead of “United States of America”, using pictures of David Crosby instead of Benjamin Franklin, and nowhere can the bill claim to have been issued by the US Treasury. One source for money in early films was old Mexican pesos rendered obsolete after the revolution in 1920, and many films over the next few decades featured these bills. However, as film quality and clarity advanced, it became easier for the audience to point out phony props, and so prop designers had to step up their game when it came to details and believability. Now thanks to High-definition television and 4K, images are so clear that you can see every minute detail, images look so clear and so real that they look fake. In addition to seeing every hair and every pore on an actor’s face, you will also be able to see things like make-up and prosthetics, and any minuscule mistake on a prop will stick out. Prop makers need to make the money look real enough to be believed on film, but not so real that it can be considered counterfeiting. But even after following all the rules, it’s almost inevitable that trouble can arise when dealing in the phony money biz. In a scene from the film Rush Hour 2, an explosion causes thousands of bills to rain down in a casino in Las Vegas. This fake money found its way into a few anonymous extras and onlookers pockets and were passed off as the real thing in more than a few transactions on the Vegas strip. The makers of the dubious currency, California-based prop company called Independent Studio Services received a cease and desist to end production on their fake currency, and were ordered to turn over all their digital files and inventory. Although ISS still maintains that they followed all of the rules for printing the money – there were at least 28 differences, different size, and did not claim to be issued by the US Treasury, the props were deemed too realistic. The Secret Service confiscated and destroyed approximately $200 million dollars in prop money from ISS, a loss of about $160 thousand dollars in real money. The Earl Hays Press is so careful when dealing with printing prop ls that each printing plate is sent to the Secret Service for pre-approval, and then destroyed after the print run. But even with these precautions, Earl Hays ran into for the 1965 film The Cincinnati Kid, where the 1930’s era prop money from Steve McQueen’s poker game looked a little too real. Hernandez recalled the incident in an interview with Bloomberg Businessweek “The whole thing is a stud poker game, so for an hour and a half money is going to be flowing all over that table. “So we did artwork on the money. The law says you cannot use any part of a real bill. So we did everything phony, the numbers, everything was original art, all the way through. But it looked amazingly good, even though nothing was from an original bill.” But then the money showed up in bars and clubs in New Orleans, and Earl Hays Press got a knock on their door from the Secret Service. Then again in 2000, a metal band filming a music video in Florida threw prop bills into the crowd, and some of it didn’t make it back and ended up later being spent by some of the audience members. The props were approved, but then trouble arose when the fake bills started showing up in shops and banks across the country, and were traced back to the creator, Earl Hays Press. The Secret Service came to the press and collected the plates, then they had the printers burn their remaining paper bills in the lot behind the press while they supervised. After over 100 thousand dollars of fake money was burned, the Secret Service then even confiscated the ashes. The moral of the story? Be careful when printing fake money and fake news? I guess? I hope this mini dive into prop printing piqued your interest. If you would like to learn more about Earl Hays Press, or how newspapers are made, or what not to do when printing fake money, I have posted links to all my sources in the show notes. For more information about Books in the Wild podcast, you can follow me on Instagram and Facebook @ Books in the Wild Podcast, or visit booksinthewild.com. I can also be reached at booksinthewildpodcast@gmail.com. Hello and welcome to Books in the Wild, the podcast about exploring books. I'm Keri Schroeder. Today’s episode is all about unreadable books. What does it mean to read? How do we garner read meaning from text written in a language that we do not understand? Today We will talk about the process of reading, and I have some fun historical and contemporary examples of indecipherable books. But first, I want to announce a momentous occasion: Books in the Wild has reached its tenth episode! That's like 70 in dog episodes! And we are now reaching the end of 2017, and the beginning of a new year, which means new hosting fees. To be candid, with hosting fees, equipment and research materials, it costs me about 4 or 500 dollars a year to produce Books in the Wild, which of course doesn’t include any of my time or the donated time of my lovely friends and colleagues that I have pestered into appearing on this show. And though I certainly have no illusions of ever monetizing this podcast, I promise to never try and sell you mattresses or underwear, it would be nice if this labor of love was a little less labory. If you enjoy this podcast, and would like to see it continue, your support can be as simple as just reaching out, writing a review on Apple Podcasts, or sharing Books in the Wild with friends. Public reviews bump up the visibility for this podcast so that it shows up on recommended lists, so that more people can discover it. I will also be adding some new Books in the Wild items on my etsy shop, such as commemorative zines, keychains, and enamel pins as a sort of fundraiser for the upcoming hosting fees. You can find more information at Books in the Wild .com, coyotebonespress.etsy.com or in the links provided in the show notes. Thank you so much to everyone for your continued support and especially to those who have reached out with feedback, or just to say Hi. It really does mean alot to me. And now let’s get into some Unreadable Books! Imagine yourself as a young child, before you were fully able to read. Perhaps you were thumbing through books from your parents’ shelves, or picking up the most interesting looking covers at the library. Imagine yourself opening a hefty hardcover book, almost too big to carry, and flipping carefully through the pages. You are already familiar with your own favorite books, ones with bright illustrations and short sentences. You know that Where the Wild Things Are is different than Green Eggs and Ham, and so you know that books can have many different stories. You know that books have meaning. The pages in this dense hardcover though are thinner than you’re used to, and jammed full of such tiny letters, and where are all the pictures? You recognize a few words here and there, but the rest is daunting. You skip around looking for clues, looking for pictures and trying to connect these unfamiliar words to the words you know. If you could only crack the code, all the book’s secrets would be revealed. Books themselves hold a position of authority, whether the meaning of that book is clear to us or not. One commonality that all writing has, is that someone at some point felt like it was worth writing down. One writes down things that they do not want to forget, or to communicate with others, or to make sense of a story or idea that is in their head. And that’s just step one to making a book. Next you have editing, typesetting, layout and design, printing, collating, sewing, binding. It is the process itself that imbues the book with some of its meaning. There aren’t really any accidental books - a book means that someone out there felt that the content had significance. But what if a book’s meaning was purposefully hidden from its reader? How do we interact with a book if traditional methods of reading do not work. First, let's consider how we read. In episode 1 of this podcast, we talked a little more more in depth about reading, but in a nutshell, reading is a cognitive process in which our knowledge, senses, and thinking skills all work together to decode a series of symbols to derive meaning and information. And in an even tinier nutshell, reading means that our eyeballs and brain have been taught to the stuff we see to the stuff we say. But of course, this type of decoding and correlation isn't as easy as it seems. To be fluent in a language, you must be able to not only recognize the individual letters and symbols, but how they combine together to make words, and then understand what those words mean, and then comprehend the order of words to derive the meaning. Then you need to somehow figure out all the different tones and nuances and idioms of a language, like for example, you would need to somehow know that when I said “in a nutshell”, I really meant “to summarize” and there are no actual hard external kernel coverings involved. Written language can be composed to convey messages at many levels. These messages can range from the purely functional, to the depths of abstract artistic expression. How do you know what is what? It isn’t actually always clear. Let’s consider the book Animal Farm by George Orwell. It is a story about farm animals banding together to rebel and overthrow the human farmers, then they start betraying each other and pigs start wearing pants. Animal Farm is also about the Russian Revolution and subsequent rise of the Soviet-Union and a critique of Stalinism. One of these story lines would be apparent to anyone who is even semi-literate, the other story line would really only be apparent to those with the correct combination of historical knowledge and critical thinking skills. You would need to recognize these words, these characters as not only what they are literally representing, but also what they are symbolically and allegorically representing, in relation to a historical event with which you are familiar enough with to even make the connection. So, how do we even begin to comprehend and decipher symbols? Are symbols universal? Yes, no, kind of, maybe, sometimes, are the answers. There are over 6,000 languages out there, some more common than others, some are dead languages, some are exclusively oral languages while others have corresponding writing systems. Then within those languages you’re going to have various dialects, accents, and other regional and cultural differences. There are usually some reliable commonalities in most languages, because all symbol systems are a created by humans. So, in order to consider universal symbols, we need to think about universal human traits, needs, and experiences. Let’s say we were living in a cave before language was invented, and needed to communicate to our cave neighbor. We’d probably develop symbols for concepts like me or you, the objects we see around us, maybe that bright burning thing in the sky, and what happens when that bright burning thing sets, maybe we need to count how many of a thing we have in our cave, or explain directions to your cave. We visually express things from our environment through pictorial representations, like if you wanted to show an ox, maybe you’d draw a picture of an ox. Then over time, this ox becomes more and more simplified and more abstract until it looks like a few lines for a head and maybe horns, then eventually just turns into a letter A and is intermixed with other symbols to create a code to be used in different combinations to express even more complicated ideas and concepts. There are so many potential variations, that as these characters become more abstract and less representational, the fewer the number of people there will be who can understand it. And so how and why would one choose to make a book that cannot be read by known traditional methods? And furthermore, how can we read a book that cannot be read? How can unreadable books still retain meaning and evoke reactions from readers? Let’s say that you have just purchase a crate of old, forgotten books from the storage of a defunct rare books seller. You sit down in your office, excited to pry open the crate like a child on christmas. You open the crate and sort through worn codices and tattered manuscripts. You inspect each book, probably first looking for the title and author, then maybe flipping through the pages to inspect for damage or marginalia. You’re searching for clues to help you decipher the book’s meaning. Some titles you may be already familiar with, and others you may not be, but by reading the title and a few pages, you might be able to get an idea about what the book means. You can probably piece together a lot, even without being able to fully read the book - is the book heard toward children? Is it a cookbook full of recipes? Are there illustrations? Is it finely bound, or just stapled together? What language is it written in? Is it printed or handlettered? All of these characteristics can be combined together to create a fairly decent hypothesis on the books meaning and content. But then you come across a worn vellum cover, unmarked. When you open the book, there are colorful, strange illustrations and script writing that is unlike any language you’ve ever seen. There are botanical drawings with text nearby that you assume are descriptions of these otherworldly plants, whimsical and eerie human figures, and circular charts that look astrological. Some zodiac signs you recognize, like the fish pisces and a bull taurus. But why are there baby heads on those flowers? And what are those women doing in that fountain? There is accompanying text, but you are unable to read it. It is fluid and decorative, but not overly ornate. Some pages are numbered, some are not. Some have long strings of text that span the length of the page, some are broken into columns that resemble a recipe or perhaps a list. The book feels important, it feels full of magical secrets that could be revealed if only you could crack the code. The book I am describing, and whose meaning has eluded readers for centuries is Beinecke Cipher Manuscript 408, also known as the Voynich Manuscript. As you may have guessed, the Voynich Manuscript is an unreadable book. It has had a resurgence in the zeitgeist of recent book mysteries. It is in the top of nearly online listicles of weird and esoteric books. It has been a subject of historical fiction in podcasts and films. And you usually find an article written about it every few months by someone claiming to have deciphered it. Which as of today, in December 2017, it has not yet been deciphered. The manuscript is currently in the Beinecke Rare Books and Manuscript Library at Yale University. It was gifted by rare books dealer Hans P Kraus, after being purchased from Ethel Voynich, the widow of rare books dealer Wilfred Voynich of whom the manuscript has become colloquially named. Voynich himself purchased the manuscript in 1912, which was amongst a bulk lot of Jesuit manuscripts in Italy, near Rome.. Voynich often dealt with rare books and manuscripts, his specialty being obscure one-of-a-kind finds. This manuscript, however, was more intriguing than most. He personally believed that the item could have originated from English philosopher Roger Bacon and was on a mission to prove it. The manuscript itself is made of parchment, and contains colorful illustrations of astronomical charts, botanical drawings, what appears to be alchemical recipes, and is written in an unknown script. This manuscript, Voynich kept for himself, trying to decipher its meaning until his death in 1930. The manuscript is unusual for a number of reasons. First, its provenance is convoluted at best. The first recorded history we have of the Voynich Manuscript is a letter written in 1665 about it being sold to Holy Roman Emperor Rudolph II, and it was thought to have been written by Roger Bacon. The letter does not say who sold the manuscript, though some speculate that it could have been 17th century astrologist, necromancer and mathematician John Dee. However, this isn’t likely given that the only real evidence that we have for this transaction is that it would be a really fitting story. After Rudolph II. the manuscript seems to have had at least three different owners around Prague and eventually was hidden away in a Jesuit Library. And as it happens sometimes, a stash of these old manuscripts were sold off as a lot, which Voynich purchased. The manuscript has been carbon dated and determined to have been made between 1404-1440 which rules out Roger Bacon as its creator. It is written on parchment, which is tanned and stretched calf skin, rather than paper. As you might guess, parchment is a good deal more expensive than paper, meaning the the creator or financeer of the manuscript was wealthy. Or another option is that it was an elaborate medieval hoax specifically made to appear mysterious and rare and therefore valuable. The other pigments used in the book are primarily white, green, yellow, brown, red, and blue, all were inexpensive, common pigments used in the period. Usually manuscripts are assembled by several different people, there is a scribe who writes, typically copying from an exemplary master copy, a rubricator who adds ornamental details to the text, and illustrations. Given how intertwined the text and imagery is in the Voynich manuscript, it suggests that they could have been completed by the same hand, or if separate they worked very closely together. Although the manuscript was created through typical medieval means, the script is apparently an invention of the scribe, as it does not match any known alphabet, and doesn’t appear to have the same hesitation present when copying from a master model. The lack of breaks and hesitation also suggest that it was made by a confident hand written with purpose. It is this sense of purpose which make the Voynich manuscript one of the most intriguing books of its kind. The mystical illustrations and its resemblance to recipe or diagram format make readers keep coming back to try and decode it. The manuscript consists of 102 pages, some are numbered and some are not. It has been determined that its current binding is not original, but it is not known what its original binding was. Based on the subject matter of the drawings, scholars have divided the contents of the manuscript falls into six sections: botanical, astronomical, biological, cosmological, pharmaceutical, and recipes. But even though the topics may be recognizable, the specifics are not. For example, the botanical drawings are recognizable because they symbolically resemble plants - there are roots spreading below, stalks growing above, and diagrams reminiscent of flowers or seeds on top. We recognize these images symbolically as plant life, of some kind. There are tight, repetitive linework patterns beside each diagram, some with lines jutting out from a specific area. We can use our best judgement to determine that this is text, most likely identifying not only a specific type of plant, but also specific parts of the plant. The Voynich manuscript contains 113 drawings of as yet unknown plant species, with illustrative color details and what appears to be texts describing it. The astronomical charts have been categorized as such because some constellations are recognizable, it looks similar to other medieval astronomical charts from the time, but there are anomalies. I think that one of the reasons why people have been trying to decode the Voynich manuscript for so long instead of just dismissing it as nonsense is because of it familiar aspects. We recognize some astronomical signs, we see the resemblance of the botanical and biological diagrams to our own known botany and biology. We recognize the patterned repetitive designs surrounding the illustrations as writing - meaning that it is dissimilar enough from drawing that we would consider it a separate component. It means that although we cannot read, nor understand the language that it shares enough similarities that we still recognize it as writing. We are basically using what we know, what we have seen in other books to make sense of the Voynich manuscript. According to the Primer of Visual Literacy, “Visual data has three distinctive and individual levels:: representationally - what we see and recognize from environment and experience; abstractly - the kinesthetic quality of visual event reduced to the basic Elemental visual components, emphasizing the more direct, emotional, even primitive message making means; symbolically - the vast world of coded symbol systems which man has created arbitrarily, and to which he has attached meaning. Let’s use a bird for an example, a dove. And i mean a picture or drawing of a dove, not a real life dove. This is key. On the first level representation Ali you recognize the image as a dove a bird. On the first level you recognize the image is of a bird. On another level, you recognize that it isn't an actual bird, but just a purposeful combination of pigment on paper. And on a symbolic level you might interpret the dove as a symbol for peace or love. You do not need to be literate to process visual information, but abstract symbols need to be learned in the same way we learn language. Another such book worth discussing in this manner is the Codex Seraphinianus by Luigi Serafini. Which is another such book, like the Voynich manuscript that no matter how literate, educated, and masterful of semiotics we might pride ourselves in being, the meaning of the Codex Seraphinianus still remains elusive. Upon first inspection, The Codex Seraphinianus is a large, heavy tome, of around 9x14” and 2” thick. The cover and binding vary according to the editions, but they are all hefty and compared to a lot of oversized coffee table books, nicely bound. When you open the book, you’ll notice that there is no introduction or table of contents, at least not in any language that we can read. The Codex is beautifully, painstakingly illustrated, and like the Voynich Manuscript, filled with many diagrams and what appear to be biological and botanical drawings. The type is not perfect, it looks handwritten, but there are repeated characters in the same way that our letters might look similar enough to recognize it as certain letters but are not identical. The drawings are surreal. They are almost recognizable, but there is something uncanny about them that prevents us from fully comprehending what we are seeing. It is highly organized, and therefore purposeful. There are figures that are human-like, but they differ in that they have machinery replacing various body parts, or elaborate alien costumes. There is flora and fauna that is otherworldly but similar to those which we might be familiar. There are images that are in sequence, which makes us attempt to create a narrative. And this is a rather long quote I am going to read, but it was so good I wasn’t sure where to cut it. This is what Italian magical realism author Italo Calvino says of the Codex Serafinianus: In the beginning, there was language. In the universe Luigi Serafini inhabits and depicts, I believe that written language preceded the images: beneath the form of a meticulous, agile, and limpid cursive (and strength lies in admitting it is limpid), that we always feel on the point of deciphering them just when each word and each letter escapes us. If the Other Universe communicates anguish to us, it’s less because it differs from ours than because it resembles it: the writing, in the same way, could have developed very similarly to ours in a linguistic forum that is unknown to us, without being altogether unknowable.… Serafini’s language does not distinguish itself only by its alphabet, but also by its syntax: the objects of this universe evoke the language of the artist, such as we see them illustrated in the pages of his encyclopedia, and are almost always identifiable, but their mutual relations appear psychologically disturbed to us by their unexpected relationships and connections.… Here is the conclusive point: endowed with the power to evoke a world in which the syntax of things is subverted, the Serafinian writing must hide, beneath the mystery of its indecipherable surface, a more profound mystery touching on the internal logic of language and thought. The lines that connect the images of this world tangle and cross; the confusion of the visual attributes gives birth to monsters, Serafini’s teratological universe. But the teratology itself implicates a logic which appears to us to, turn by turn, flower and disappear, at the same time giving us the sense that the words are carefully traced back to the point of the quill. Like Ovid, and his Metamorphoses, Serafini believes in the contiguity and permeability of all the domains of being. Even though we cannot read the book, there are certain biblio traditions that are kept in place to guide us through Serafini’s book. In the bottom corners of the pages, there are small markings. Because this is usually where we tend to number the pages of our own books, and because these markings, although foreign still seem to create a sequential pattern, we can deduce that this is a numbering system. There are also arrows and lines next to images that indicate measurements, however, they are in increments that I don't understand. It reads like an encyclopedia to an alien planet. There is an entire world present within these pages, whose meaning could be fully realized in an instant, if the tools were available to us. Codex Seraphinianus is not another lost medieval text. It was created by Italian artist Luigi Serafini between 1976 and 1978 and published in 1981. Serafini was 27 years old at the time, purposefully playing with the ideas of combining text and image to create a semblance of meaning. Of the writing, Serafini says, “ the Quest for this new alphabet seem to me to be the most urgent thing that had to be done. Actually I had to invent one that suited my hand. So I began by scribbling lines that twisted and curved and Curly Q's and arabesques. And from that tangle of ink I slowly distilled calligraphy complete with upper and lowercase letters, punctuation and accents. It was script that contains the dream of many other types of script”. So we have covered a book of a truly mysterious origin, and a book that was written psychically by a cat. Now I have a couple of contemporary examples by book artists, making books that are not able to be read in a traditionally manner, and yet whose works still feel heavy with meaning. You find yourself in a room. Hanging on the walls are prints, broadsides of beautiful handmade paper, and free flowing dark indigo watercolor imagery. There is finely letterpress printed text in columns on each. At least, you recognize as text although you can’t quite make out the words. The text feels familiar and foreign at the same time. And yet, coupled with the meticulousness of its presentation, the meaning although allusive feels heavy, feels purposeful and profound. It seems to transcend language, tapping into something deeper, tapping into that something that gets lost the moment you let those feelings become words. Heather Peters is an artist and writer based out of California. 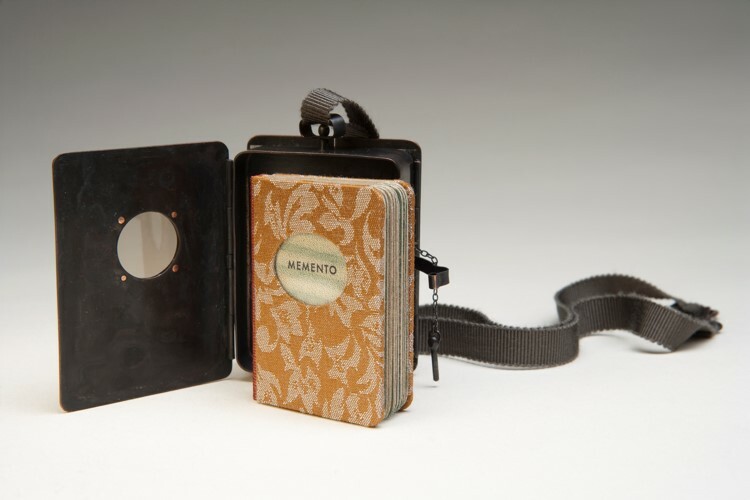 The work I mentioned is a book art installation called Meaning is the Moment Captured. The printed alphabet in question, is indeed a working alphabet created by Peters. In a printshop there exists something called a Hell box - which is a receptible or bin where damaged, unsorted metal type gets thrown. Peters carefully sorted through a hell box, and collected one of each discarded letter. In order to free them from their typographic constraint, Peters then remelted the metal type and quickly cast them into water. The letter’s new shape was then photographed and digitized into a usable font. Which then was typeset and made into polymer plates, which were then used to print. In her artist’s statement, Peters says that she sees her work with the materials as an investigation into the ways of telling a story, a way to use divination to find meaning in everyday existence, because it is believed by some historians that some of the earliest forms of writing developed through fortune telling methods that were believed to communicate with a world of spirits beyond us. The relationship between visual arts and alchemy is strong and long-standing. Alchemists attempted to learn the secrets of materials, chemically, physically, and spiritually. And although today the disciplines of chemistry and spirituality are fairly removed from each other, it wasn’t long ago they were intertwined. It was alchemists who developed paint pigment recipes and other art making materials. Even today alchemy is often used when discussing the spiritual or emotional impact that can be found in visual and literary arts, that depth that extends beyond just the visual information. Next, let’s journey to the middle of the desert. You’re walking into a vast, seemingly endless place. Even though you know you are on earth, the desert will always feel extraterrestrial. There are red, spiral rocks jutting out of the ground. There are crooked, hunched trees with talons for leaves and armored plates for bark. You see something reflecting in the sun, just a little ahead of you. As you get closer, you are able to take in the unbelievable scene. There is mechanical wreckage, all gleaning silver and twisted electronics, of what appears to be a flying saucer. As you examine the wreck, you stumble upon a strange book. Not so strange, as you did just recognize it immediately as a book, but certainly unlike any you’ve ever seen before. The cover is solid, heavy, like wood, with unrecognizable symbols and writing etched into it. Inside, each page is filled with ornate and meticulously detailed diagrams and instructions for machinery. Lavish maps and charts, with topographical details, and color-coded keys. The writing is structured, purposeful and profound. You know all this, and yet you cannot read a single word of the book. Timothy Ely, is a contemporary American artist, and a heavy hitter the book art world. Ely creates beautifully intricate one-of-a-kind manuscript books. 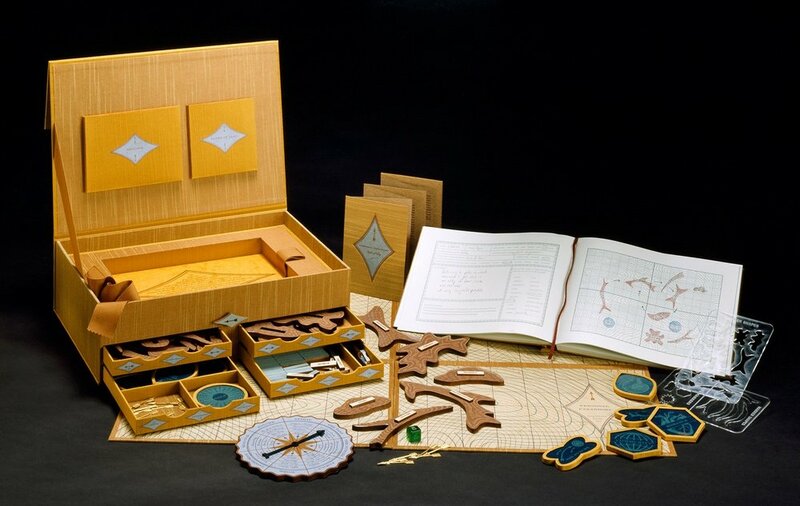 They usually are in the form of either the Planetary Collage Standard Binding or the Planetary Collage Drum Leaf binding, both structures of Ely’s own design which allow for maximum surface area on the both the pages and the covers to be written, painted, and illuminated. Ely’s books read like architectural textbooks, celestial and topographical maps, and grimoires all combined into one. They are filled from cover to cover with diagrams, charts, and a mysterious writing system Ely calls cribriform. The fact that the books are uniques, means that they were not intended for a large audience, but instead hold precious secrets. There is a power in Ely’s work that imply that the information presented could gift you with the information you would need to transport you to another planet, build world-changing technological inventions, or harness esoteric magic, if only you could crack the code. Like the medieval Voynich Manuscript, Luigi Serafini’s Codex Seraphinianus, and Meaning is the Moment Captured series by Heather Peters, Tim Ely’s work in unreadable by traditional methods, and yet they all still exude meaning. 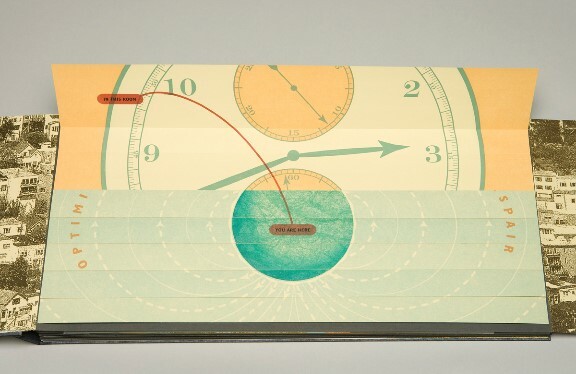 I want to make special note of Ely’s quote about reworking his books, “Until it all reads… “ Artist’s books make use of all of itself to convey its meaning. This goes beyond aesthetic preferences or graphic design. It implies that there is intrinsic meaning in the materials themselves. If this sounds a little woo-woo for you, let’s pretend you received a love letter, you know from someone you would want to receive a love letter from. Would it feel differently if you received a handwritten letter on stationery than if it were typed up using a default font, and printed with a home office printer? I think that they feel different. And I would argue that it doesn’t necessarily have to do with time or effort, because at least at my house dealing with my finicky cheap printer takes me just as long if not longer than just handwriting the thing. The human presence is stronger in letters and books and art and food and just about anything, if it has been touched and created by a human hand. Many disciplines have attempted to analyze and uncover where exactly meaning comes from in the visual arts, and how visual art communicates. Gestalt psychologists have been striving to understand how we organize and perceive meaning in an apparently chaotic world through principles of grouping. For example, we tend to group items together based on their proximity to each other or visual similarites. We also tend to complete shapes and patterns in our mind that might be broken or inconsistent, which is why we see a circle with breaks in it, we recognize as a circle with breaks, and not several isolated curves. It is Gestalt psychology that taught us that “the whole is other, or greater, than the sum of its parts”. And going back to the Primer of Visual Literacy, the author states that “the last level of visual intelligence is possibly the most difficult to describe and may in the end be the most crucial to the development of literature visual literacy. It is the under structure, that abstract, elemental composition, and therefore, the pure visual message.” In other words, we analyze and organize and interpret this complex system of symbols and imagery in order to understand its meaning, and yet there is something else beneath that. A skeletal visual force, a basic composition of elements that can evoke a response from us. There is an elusive but very real, pure visual energy. Unreadable books play with our expectations and our knowledge of how books usually function. There are parts that we can understand, similar patterns and traditions that are maintained. The books intrigue us, invite us to read them. Then we are faced with a barrier that we cannot fully penetrate, but which offers enough cracks and breaks to let some of the light of hope in that we will be be able to one day understand. These books are simply not able to be read by traditional methods of reading, but it does not mean that they are unable to communicate with us as readers. Instead of relying on just text and imagery to extricate meaning, we learn to read the whole book from its materiality, visual energy, composition, and personal symbolism. It requires more of ourselves to read them, and therefore, further fuels the expectation that once deciphered, their secrets will be life-changing and profound. Thank you for listening to Books in the Wild. Please visit booksinthewild.com for links and show notes. If you’d like to contact me, I can be reached at booksinthewildpodcast@gmail.com or you can follow me at booksinthewildpodcast on instagram or Facebook. Be sure to check out The Paper Carnival, my collaborative new project with Julie Chen of Flying Fish Press. The Paper Carnival creates bookish gifts and collectibles for book artists by book artists, or for normal people too. Our first release is a series of book art themed enamel pins, to wear on your jackets, printing aprons, bags, or I could keep naming things, but I’ll spare you. Visit thepapercarnival.com to get some of your own! You can use coupon code BOOKS IN THE WILD for 15% off your order! You can also visit CoyoteBonesPress.etsy.com for more book art-related items. All purchases from either site, will help out this podcast. Hello welcome to episode eight of Books in the Wild, the podcast about exploring books. I’m Keri Schroeder. I have had a few questions for the past seven or so episodes, regarding what exactly is book art. So today I’m going to reel it in and start at the beginning. What is book art exactly? What is an artist book? Are all art books book art? What do you mean by codex? Or livre d’artiste? Are you making these words up? I’m glad you asked dear listeners. And I hope we can reach these answers together, and have some fun doing it. Today we are going to talk about the book art basics. I’ve invited a couple book workers to play book art trivia today, and got a new kazoo so you know we’re all in for a big treat, and the best thing about book art trivia is that win or lose – we’re all equal in the world of esoteric nerdery. We will go over a bit of history, and I also have compiled some frequently asked questions from our listeners. I have a few announcements about some upcoming events, but I’ll save those until the end of the episode. I also recently discovered that Books in the Wild has reviews on iTunes – I had no idea because apparently iTunes doesn’t notify you about these sorts of things? So I wanted to thank Simon, Jim, and LizzyLou for their thoughtful and kind reviews. It makes me feel all warm and fuzzy inside to hear that people enjoy the podcast. So thank ya’ll so much. You too can leave a review on iTunes or wherever and I will probably find it eventually. Hello and welcome to BOOK ART TRIVIA. I am your host, Keri Schroeder. Book Art Trivia consists of three rounds covering various topics book arts terminology, book history, bookbinding structures, typography and printing. For those playing along at home, I would love to hear your answers too, so feel free to comment on the episode post on booksinthewild.com or send me a message. Today’s book artist contestants are Ariel Hansen Strong and Faith Hale! Welcome and thanks for playing. And now for Book Art Trivia Round One! These questions will cover general book terminology. Each contestant will have the opportunity to answer. And I may or may not make some comments in between. We’ll see how it goes. Faith, any more to add? Keri: Excellent job! Book arts is an umbrella term that houses all things bookish. And by bookish, I mean pertaining to the book as a book itself as an object. 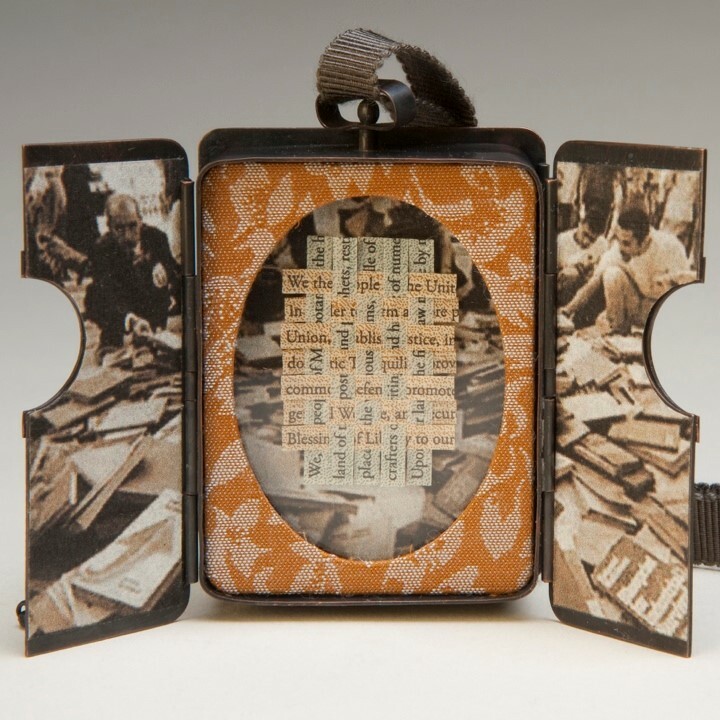 Things like bookbinding and printing and papermaking can all be included under book art. Then within those subsets are even more subsets. And within those subsets are even more subsets with experts questioning the definition of these subsets. So for example bookbinding is a part of book arts for sure. But then within bookbinding there are fine binders and commercial binders and library binders to name a few. Then within even the subset of fine binders you have those that specialize in gold tooling, or leatherwork, or historical bindings, then maybe within the subset of historical binding specialists you’ll have ones that work exclusive on one particular structure. Or within printers there are those who specialize in letterpress, or offset, or lithography, and so many others. There is a lot of overlap between these disciplines, there are a lot of book workers who are well-rounded in multiple disciplines and techniques, but there is also a lot of divide sometimes. Alright, on to question two. This deals with book history. In the 15th century, this man introduced movable type to be used with the printing press. Who was he, and why was this a big deal? Ariel: Gutenberg! He was a German printer and publisher who created movable type out of melted metal. Which was a big deal because before movable type, books were either hand scribed or printed with wooden blocks. And unlike wooden blocks, metal type can be re-melted and reformed and type allowed for a speedy printing process, and the invention gave way for the printing revolution. Great job Ariel. And Faith, what about your answer? Faith: Gutenberg. Everybody knows this! He was a printer and he was a big deal because he introduced movable type to be used with the printing press. Um before him, you had to be super fancy to own a book, and after him you had to be a little bit less fancy to own a book. He really democratized ownership of printed stuff, and he made it a lot more accessible for the non-super wealthy people. Keri: Absolutely. Fantastic answers. Johannes Gutenberg was a German blacksmith, printer, and publisher who instrumental in the development of the printing revolution in Europe. There is a popular misconception that Gutenberg invented the printing press. He did not. But what he did do was develop a more efficient way of casting metal movable type. As Ariel mentioned, prior to this development, there were still books being made, but they were either written by hand, or they were printed from carved wooden blocks. By having movable type, this allowed for texts to be composed letter by letter and printed, then the type could be moved around into a different composition and printed again. You no longer needed to carve a whole new block of wood for each page, or spend hours or days writing a page by hand. And as Faith mentioned, this revolutionized printing making books slightly more affordable and available to not just aristocrats and the super elite. The books were still expensive, just not as expensive as previous books. For example, in 1455 Gutenberg printed around 200 copies of the 42-line bible, also aptly known as the Gutenberg bible. Each copy cost 30 florins, which was approximately three years’ salary for an average clerk at the time. However, this was still far less expensive than a handwritten manuscript bible in which one copy could take upwards of a year to make. The Gutenberg bible was a massive undertaking. Each bible consisted of two volumes totaling 1,286 pages and measuring 11-' by 16 inches. They are set in two columns of large, black-letter type of 42 lines per page. This format of having the bible pages divided into two columns was extremely influential on the style of bibles even today. Out of the 200 copies, approximately 180 were printed on rag paper, and 20 were printed on vellum which is a tanned and stretched calf skin, each vellum copy required the skins of about 160 animals. Today, Gutenberg bibles are wildly rare an expensive. Only 48 known copies survive – 36 on paper, 12 on parchment. In 1978, the going price for a Gutenberg bible on vellum was $2.2 million. A single leaf can easily fetch more than $60,000. In 1994, Bill Gates purchased a complete set, meaning two volumes of the bible for a rumored 31 million dollars. Now we’re going to jump ahead a few centuries. Question Number Three. American pop artist Edward Ruscha is often credited with creating the first modern artist book in 1963. Ruscha’s innovative book consisted of twenty-six photographs with short captions. What were the 26 photographs of, and why was this significant? Faith: Gas stations! 26 gas stations! Ed Ruscha took pictures of 26 gasoline stations, and this was significant because once again this was not fancy. I feel like all of the exciting book art advancements was when we went from super inaccessible and difficult to get your hands on, to really easily accessible, not only did he take pictures of something that any motorist can see but he made it available in a form that was a really simply printed book – it wasn’t on fancy paper, and hadn’t been done with special materials, it was just a mass-market press book, even though at the time it was super cheap and now they are super expensive to get a hold of. When I first became enamoured with this book I would look it up on ebay all the time, and I learned very quickly that now they are highly prized and really expensive. Keri: Excellent answers. Now, bringing up 26 Gasoline Stations by Ed Ruscha as a key moment in the history of book art is probably a bit contentious for some book artists. I feel like Ed Ruscha to book art is like Pablo Picasso to cubism, where you’re gonna get the art historians saying “boring” and start naming all the other artists who started cubism and influenced Picasso and yet Picasso gets all the credit, and so on. Which are all valid and true points. However, it is kind of hard to deny Picasso’s reach and popularity. Same with Ed Ruscha, where in a way, his importance to artist’s books is because of his importance to artists books. Our contestants’ answers were pretty thorough so I don’t have much more to add, other than to emphasize its importance as a democratic multiple, meaning that it was inexpensive, easily accessible, and breaks down some of the preciousness sometimes associated with artist books. THIS is a technique of relief printing using a printing press, a process by which many copies are produced by repeated direct impression of an inked, raised surface against sheets or a continuous roll of paper. This is done by composing and locking movable type into the "bed" or "chase" of a press, inking it, and pressing paper against it to transfer the ink from the type which creates an impression on the paper. What is this printing technique called? Keri: Letterpress printing comes up a lot in the book art world, because it was the primary printing process from the mid-15th century through the early twentieth century. This is when offset printing was developed and became the main printing process for books and newspapers because it was cheaper and faster. But letterpress is still used today, and there are a lot of die hard letterpress fanatics because it’s beautiful and very hands-on. Question Five. This is a tricky one. Please take as much time as you need. What is an artist book? Ariel: In my terms, an artist book is a work of art that uses or references or exists in the form of the book, or uses the qualities inherent to the book form, such as sequence, pacing, intimacy, combining text and image, or the options for multiple readings, etc. An artist book might be self-referential, as in the form refers to or informs the content and vice-versa the content informs or refers to the form. Faith: I think an artist book, it’s one of those questions that even after studying it for several years now, I can’t give you an exact definition, but I think the easiest most cop-out answer to this is an artist book is something that an artist tells you is a book. So, it can look like a book, or it can not look like a book. It can operate like a book, or it can operate totally differently. The most convenient answer that made me stop wrestling with it and stop trying to define it is that I read a book by Gord Peter and he’s a furniture maker and he says that he shows somebody something and says that that’s a chair, and sees how their knowledge of the fact that it’s supposed to be a chair affects their interaction with said chair. Maybe it’s a pile of ashes. Maybe it’s a chair but it’s been so covered with things that you can’t actually sit in it. And I feel like a book is very similar, where maybe it doesn’t have pages, or maybe it doesn’t have a cover, maybe it doesn’t even have words but someone has told you that this is a book and as the viewer you have a responsibility or a certain set of filters with which to interpret and analyze it. Or maybe just even experience it. Keri: Thank you so much for your thoughtful, detailed responses. Everyone gets a point for that one! Oh boy, the artist book. It’s not universally agreed upon where the placement of the apostrophe should be placed in artists book, let alone what they are. To me, an artist book is conceptual art, essentially, that in some way interrogates the book through form and/or concept. An artist book can be an actual book, but it must in some way expand beyond that – it must need to be a book and use its physical form to support its content. A great example of this would be Julie Chen’s book Chrysalis, which uses the metamorphosis of a chrysalis as an allegory for the stages of grief. 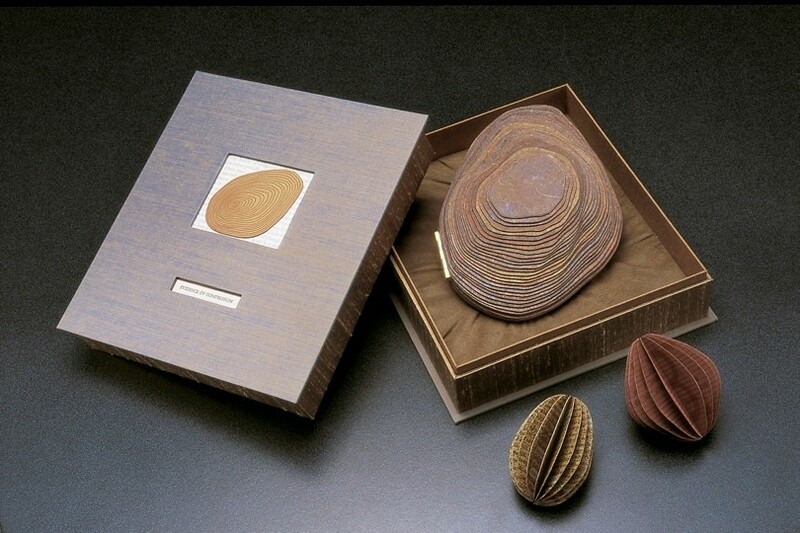 The book comes in a box resembling a specimen case, and inside sits an actual chrysalis-shaped object. The viewer must open the case, and remove this precious and delicate looking object. 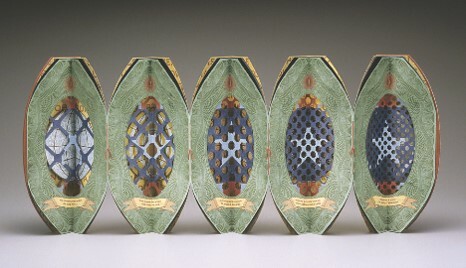 The chrysalis is held together by magnetic hinges that the viewer must then peel back to access the small crescent-shaped book inside, thereby making the viewer an active participant in the unraveling and transformation of the object. The innermost book is small and feels delicate in one’s hands. The text inside deals with how stages of grief can transform oneself into something unrecognizable and new. The reading experience of Chrysalis happens not only in the text, but all the elements of the object working together in tangent, creating an intimate, immersive experience. And yet another example of an artist book might not have any physical elements of a book at all, but instead deal with different aspects of the book conceptually. Heidi Nelson is an interdisciplinary artist whose work often explores ideas of communication, data collection, and the reading experience. Nelson’s installation Outernet Library Branch – Wave Farm is a receiving station for Outernet data transmissions in Acra, New York. The features a satellite dish antenna surrounded by Adirondack-chair-inspired seating, with a bench oriented toward each cardinal direction. The WiFi network access area is defined by a large mowed meadow. Visitors can access the expanding library collection of data broadcast from a network of satellites in space, is a new and separate system outside the Internet. Outernet is not a book per se, but offers similar experiences of a book such as the transference of information and the collaborative organization of imagery and text. On the other other hand, there are books that can contain artwork but not be artist books. Livre d’artiste are books in which the text and images tend to be not very collaborative. Usually they are deluxe editions of a classic text with illustrative prints created by famous artists. Books like a French translation of Edgar Allan Poe’s The Raven by Stephen Mallarme illustrated by Eduard Manet, or James Joyce’s Ulysses illustrated by Matisse. They are usually finely bound with ornate covers and exquisite craftsmanship. They’re luxurious books for the sake of being luxurious books, but the concept doesn’t usually extend beyond the content found within the text itself. We will return with round two after this commercial break! Woman #2: What’s the matter? Woman #1: Oh just trying to get some shopping done, I’ve been all over town but can’t find the last couple items on my list. Woman #2: That’s too bad. What are you looking for? Woman #1: Well, you know how Tim and I are redecorating? I really need a few cactus throw pillows, and a real striking centerpiece for our living room –something that really expresses our love for printmaking, and fine art, and Beyonce. Woman #2: You know, that is so funny that you would mention that and also eerily specific, but I happen to know just the place! Woman #1: Amazing! What was the site again? Keri: Now for round two of book art trivia: What am I? I will provide a definition for a book arts related item or structure. Contestants, your correct answer will name the item being described. Item One. I am a book made by many sheets of paper one on top of the other, adhered together on one side with a spine, and typically covered with a thicker, more durable cover. Yes, that counts. I was looking for something more general though. Faith? Keri: Excellent. Both answers are correct. A Codex is a typical, everyday book, with pages and a spine and a cover. Ariel mentioned a perfect bound book, which is a type of codex. Perfect bound is a commercial binding that consists of single-sheets of paper glued on one edge and attached directly to the cover – think of a mass-market paperback, that is a perfect bound book, ironically named because they are just awful. Item number two. I am an inscription usually found at the end of a book that contains facts and information about my production. Faith: The inscription usually found at the end of a book is the colophon. These are the nerdiest things I’ve ever seen in my life, because they’ll tell you, I mean not all the time, sometimes they’re very normal and they give the most basic information about the book but sometimes they talk about the paper and where it was made and who made it and the typeface and who designed it and the ink and what kind of ink it is, and that I think is the birth certificate of the book. It gives you all the information of where it came from and who made it come from there. Item Two. I am a slim slightly tapered piece of bone, or sometimes I am now made out of Teflon. I fold and crease paper. Faith: I am a bone folder. I love Teflon folders. I also love bonefolders that have been altered. When I worked for the fine binding apprentice, he had like these super tiny ones and he had big fat ones and he had all different sizes but I did learn though when I had to help them shape them is that you should never sand bone outside of water because the flakes of bone will get into your lungs and do horrible damage. Keri: Item three. I am a book made of one long sheet of paper, folded in a zig-zag formation. Faith: a book made of one long sheet of paper, folded in a zig-zag formation is an accordion book. Keri: I will accept both of those answers. It does have a lot of names. I was aiming for concertina or accordion book but now I am realizing that snake book or flutter book would work too. Item four. I am reddish-brown deterioration spots on paper, and share my name with a cute furry forest dweller. Faith: I am foxing! Why is it called that though? Does anyone else know? I wish I did. Keri: Correct! Foxing is an age-related detoriation of paper. You ever see an old book or paper with reddish brown splotches? That is called foxing. And thank you for your question Faith – I did a little bit of research and it seems that foxing is possibly named because of the reddish brown color, or because the color is caused by the chemical ferric oxide. This concludes round two of book art trivia. It’s a close call! If I were actually keeping score, I think it’s a tie? We’re about to start our final round, but first here is another message from our sponsors. Keri: Welcome back folks. Before we move on to round three, let’s learn a little more about our contestants. First we have Ariel Hansen Strong. Tell us about yourself Ariel. Fantastic. It is a pleasure to have you on the show Ariel. And now let’s meet Faith Hale. Tell us about yourself Faith. Faith: My name is Faith Hale. I work for a company called CreativeBug that does online art and craft tutorials. So I had originally gotten my MFA in Book Art and Creative Writing from Mills College. I really wanted to teach book art in a college setting, and now that I’m at this kind of platform it’s basically like a Netflix for crafters. I’m really excited to be able to expose book art to a broader audience. In the month of September, I’m doing a daily book art class and each day we do a spread or technique and it’s really interesting to see the kinds of people that are taking my class and what is coming out of it. It’s such a privilege and I’m perpetually excited to be working with this kind of community. Keri: Wonderful. Is everyone ready for Round Three, Who’s that book worker? In this round, I will provide the duties and job description of a book professional and you will name their job title. Number one. Sam deals with the provision and maintenance of a collection of books, which is usually accessible to a defined community for reference or borrowing. Sam’s duties may include archiving, building bibliographic databases, and developing community events. What is Sam’s profession? Keri: Correct! Two points! Profession number two. Dean is a craftsman who works in a specialized trade that assembles and covers books. His duties may include creating decorative coverings, leather working, and gold tooling. What is Dean? Faith: Dean is a craftsman. I would call Dean a fine binder. That was actually my first professional job in the book world, was apprenticing for a fine binder and he was so perfect. He was everything you would imagine a bookbinder to be: angry, and loud, and very opinionate and also super passionate and excited and delicate. He made the most exquisite historical reproductions and also is very skilled leatherworker. Keri: That is correct. And thank you for the insider look at bookbinding apprenticeships Faith. Profession three. Castiel preserves books and manuscripts from further damage. He does this by repairing when necessary with archival, reversible materials and ensuring proper storage and care. Faith: an archivist. I think? Keri: Eh, I’ll give points for both those answers. The answer I was going for was book conservator, which is a profession dedicated to the preservation of books and paper. They don’t necessarily restore books and paper, but make reversible repairs and decisions regarding its storage and environment in order to prolong the life of the object. Profession number four. Bobby creates artwork that deals with the concepts and form of the book. Keri: Correct. That was a bit of an easy one. This one might be a little tougher. Profession number five. Ruby is a designer who specializes in the art of arranging type to make written language legible, readable and appealing. She selects and arranges typefaces, point sizes, leading and kerning. Faith: I think that Ruby is a graphic designer. Keri: Excellent. I’ll accept both answers. I was going for type designer or typographer which I guess is a specialty within graphic design. What an exhilarating game! It looks like the score is uh… fifteen and fifteen? Which means we have a book art trivia tie because we’re all winners here. For those playing along at home, I would love to hear your answers as well. Send me an email or post on our facebook! I recently asked on facebook for book art questions, and asked some book friends for their frequently asked questions as well. And I mean book friends like friends who are also into books, not literal books that I consider to be friends, I’m also not sure if that’s something that really needed clarification, but you never know. So I took these frequently asked questions and talked about them with some fellow book artists and friends and we came to some answers together, so it’s not like I’m speaking on behalf of all the book artists in the world. So here are the top five questions we have gathered. Question two. How do book artists make money? Who buys this stuff? Great question. And something that I definitely something that I need to learn more about myself. Book artists are just artists, just like the painters and photographers and other creative professionals and so I think their source of income is much the same as any other artist. You have the commercial artists that make money by making custom products or designs – for book artists and printers it would probably be stuff like wedding invitations or posters or labels or custom bindings for books, that sort of thing. Then you also have the fine art side, where book artists might sell their own creative work to libraries, museums, or private collectors. Education is another component, there are a lot of book artists who make a living teaching book arts in the many book centers out there like San Francisco Center for the Book, or the Center for the Book in New York, or The Paper and Book Intensive, or Minneapolis Center for the Book, or there are many book art programs at a university level such as Mills College, University of the Arts in Philadelphia, Univerisity of Iowa, University of Utah, Wells College, San Francisco Art Institute… This is by no means a comprehensive list, there are a lot out there. Question three. How is Book Art different from graphic novels, zines, or art and print portfolios? Oh my gosh Selena, I don’t know. This is a tough one. But I think the answer is, they don’t have to be different, there can definitely be some overlap, but at the same time, just because a book has art in it doesn’t mean it is an artist book. I think to be an artist book, or to even really be housed under the term book art, the content really needs to be intrinsically tied to the book itself, either in concept or form. Whereas, there may be many graphic novels whose stories can be told just as well through another medium and really ignores the fact that it is a book at all, to be an artist book means that the form of the book itself really plays a big part in the overall meaning. Book Art is also one of those things where the more you learn about it, the more aware you are of just how much you don’t know. It’s like when you’re a little kid and you learn that Columbus discovered America and Pluto is the ninth planet and all the dinosaurs seemed to live together during the same time period, and then a few years later you’re told “by the way, literally none of that is true, welcome to the uncertainty and existential dread of adulthood, good luck trusting anyone ever again.” So maybe book arts is like that? But we get to make stuff with our hands? Question four. Do you hate e-readers? I think there’s a misconception that book artists are holding onto dead technology for the sake of I dunno, it’s preciousness? or for tradition’s sake? But I don’t know any book artists out there that are anti-technology. I believe that Book artists make books because there is something about the care and craftsmanship that adds a noticeable difference between a hand-made book and a commercial paperback. It’s not merely to add difficulty and time to the task, I mean, no one likes things to be more difficult if you’re essentially getting the same outcome. I also don’t believe that new technologies necessarily need to devour each other, there is plenty of room for e-books and physical books. Question five. What do you think is the future of the book? Also a tough one. Because I’m not a witch or a fortune teller, but I think that in the near future you’re going to see a rise in small independent presses and finely made books. Because publishing has wildly changed due to things like self-publishing and the e-books, and it’s really difficult to compete with online shopping or big companies that kind of have the market cornered for mass-market books. So, we have to offer something that they can’t which is human touch, craftsmanship, personalized experiences, maybe more limited edition works, things like that. I also think there will be or should be more cross-over between artist books and digital books, hopefully. This question especially, I would love to hear your thoughts on. I wanted to thank Ariel Hansen Strong and Faith Hale again for playing Book Art Trivia, you can check out Ariel’s artwork at ariel Hansen strong .com or follow her on Instagram at cloudship_ahs and facebook as cloudship. You can find Faith’s zines and other creative projects on Instagram @ faith, with like 11 a’s, or go to creativebug.com to sign up for her online book art classes. This episode takes the form of a "commonplace audiobook" - an mix-tape of inspiration to help overcome artist's block, ranging from information about the creative process, excerpts from interviews, music, and tips on overcoming creative block. Bully – British canned corned beef. “Bully” is believed to be a corruption of the French bouillie meaning “boiled”, and due to the image of bulls depicted on the tin cans. Cold Meat Ticket - Identity disc. Soldiers were issued two identity discs. In the event of death, one disc was taken from the body (the cold meat) and one remained. Tommy- British soldier. Derived from Tommy Atkins, which, much like John Doe in the U.S., was a name on sample forms to represent a a typical British army private soldier. Whizz-Bang - A high-velocity shell. Derived from the noise of the rapid flight and the explosion of a German 77mm shell. BBC Horrible Histories "Tudor Spelling Bee"